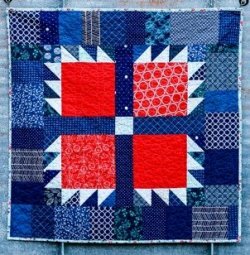 Make this cute baby quilt and use up your scraps! Using a square and triangles, Jeni created a design to look like a bear paw. By choosing to create the bear paws in red, and using navy fabrics for her background, she lets the fabric shine and makes those bear paws really pop. Bonus! Jeni includes a bag tutorial if you would like to gift this quilt in a bag.
" This quilt comes together quickly, and takes advantage of scraps for the background. I'm also including yardage/cutting if you'd like to use a single fabric for the background. "